I have received a quiet few emails from my readers suggesting a vineyard style category. 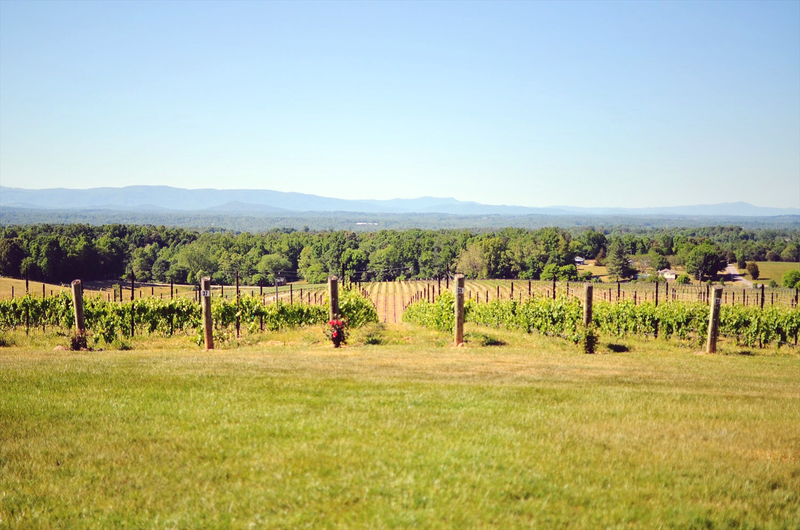 My boyfriend and I thought that was a great idea, since we both love to visit Yadkin Valley wineries very often. I'll be working on this project and labeling my posts in order to come up with this category soon, and I will name it "Wine Country Style". If you're following me on Instagram you should know by now that I love wine, therefore, I love trying on different wines from North Carolina area. Every time I visit a winery, I think about what to wear and what will be appropriate for the weather at the moment. 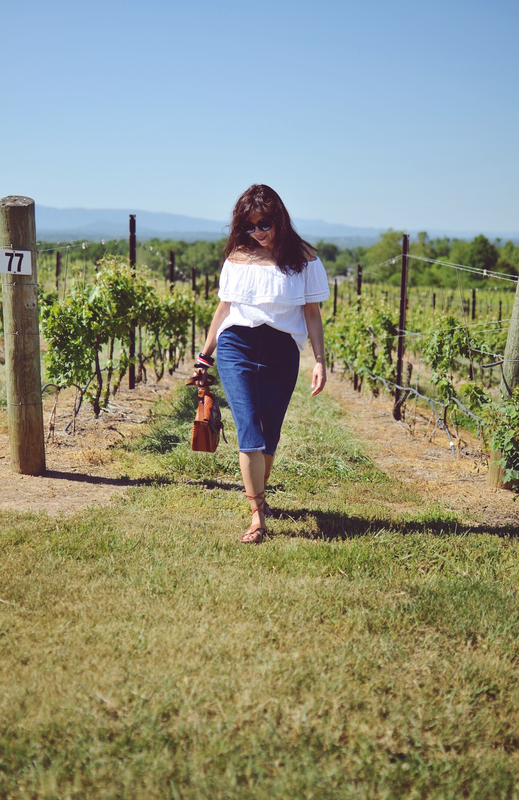 My mood usually craves for outfits with a bohemian flare when going to vineyards, and I guess is because the landscaping and atmosphere compliments this type of dress code. 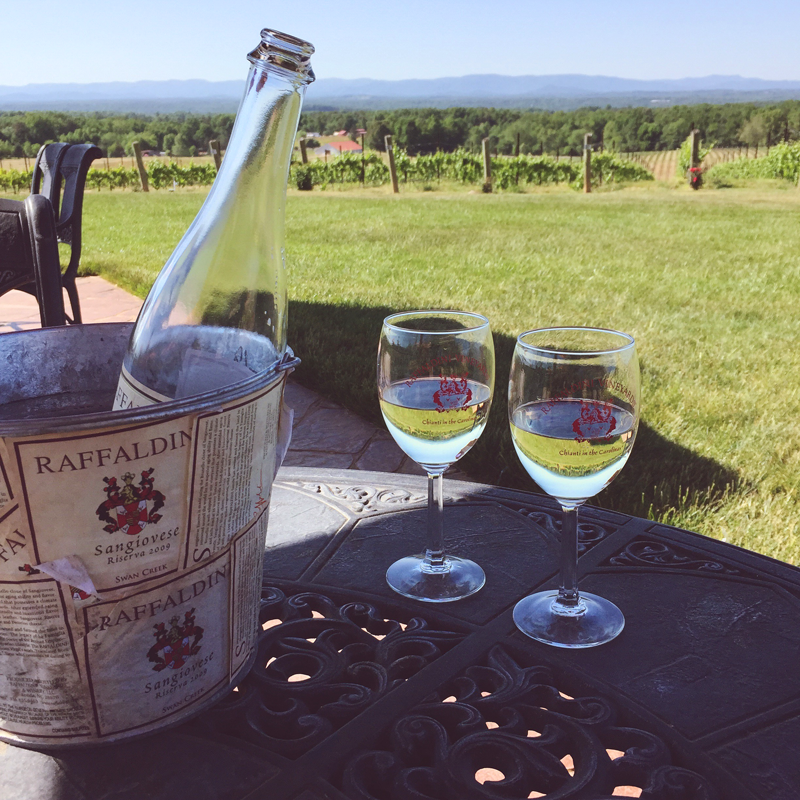 In this opportunity, we went back to Raffaldini Vineyards and Winery after a busy day around the house. 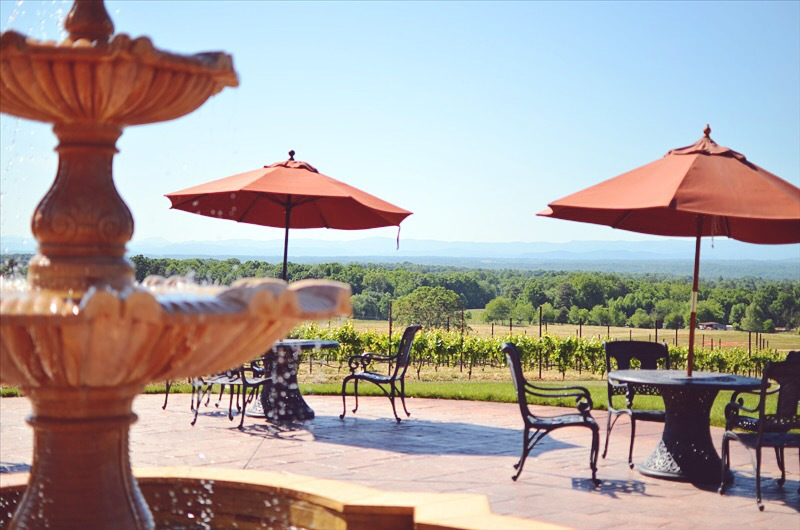 When the weather is warm or even in Fall, we love to come here and enjoy the view while sipping their delicious wine. The view is terrific, you can see from the deck a wonderful belt of North Carolina Mountains. 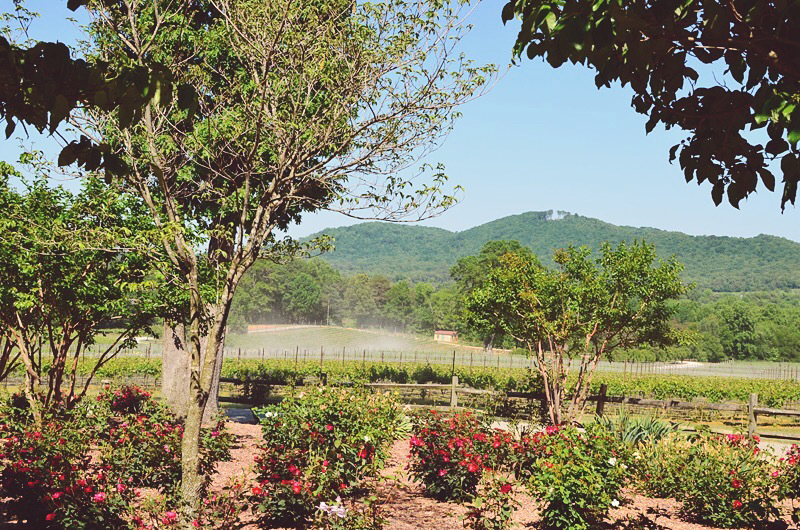 My favorite part from this winery besides their summer wine, is the yellow roses fence that adorn the dirt road entrance. This place is a combination of rustic and sophisticated touches, which pretty much screams my name. 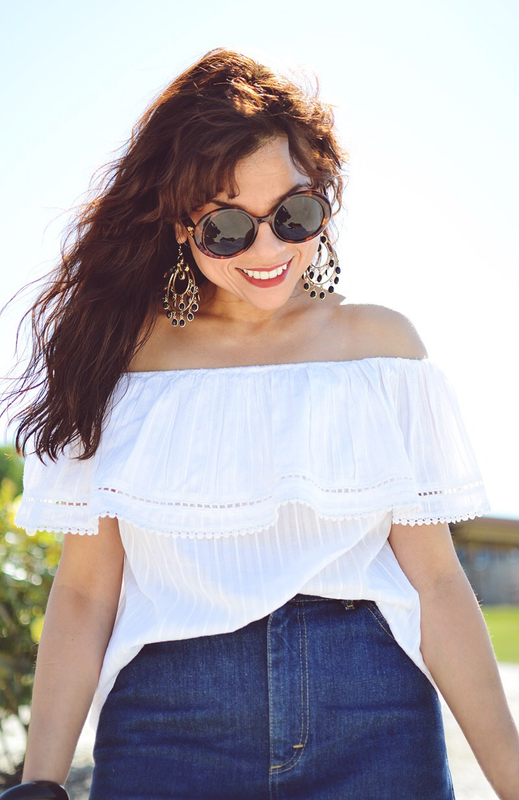 In this occasion, I decided to wear an off-the-shoulder blouse with a pair of sweet gladiator sandals. 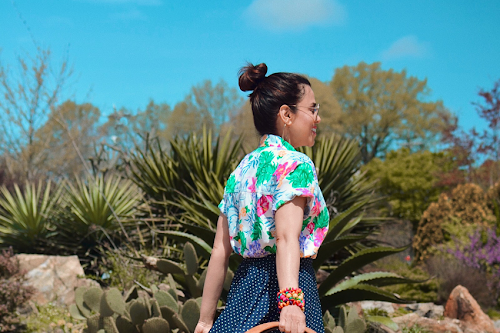 I wanted to keep a good balance with my look, therefore, I decided to cover most of my legs with a midi-skirt, that way my shoulders are the only ones doing the talk. 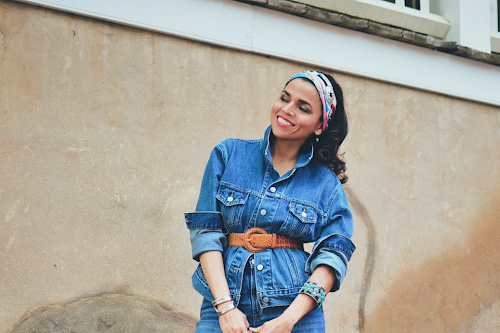 A necklace was completely out of the question, however, a large pair of chandelier earrings seemed to be a better idea to wear with an off-the-shoulder top. No hat? Well, sometimes I want to let other pieces stand out and hats can easily steal the attention. He recibido varios correos electrónicos de mis lectores sugiriendo una categoría de estilo viñedo" en mi blog. Mi novio y yo pensamos que era una gran idea, ya que nos encanta visitar los viñedos del Valle de Yadkin muy a menudo. 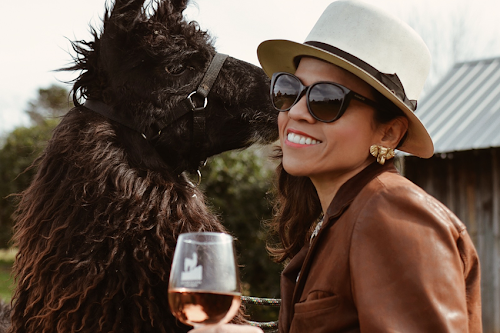 Muy pronto la subiré, ahorita estoy trabajando en modificar unas cositas en mi blog, per tan pronto pueda la cargaré debajo de la categoría "outifts" con el nombre "Wine Country Style"
Si ustedes me están siguiendo en Instagram deben haber notado que me encanta el vino, por lo tanto, me encanta probar diferentes vinos de mi área. Cada vez que visito un viñero, pienso en qué ponerme y cuál será el look mas apropiado dependiendo del clima. Para ir a los viñedos my estado de ánimo generalmente ansía por trajes con un toque bohemio, y supongo que se debe a que el paisaje y el ambiente complementa este tipo de vestuario. En esta oportunidad, regresamos a los Viñedos de Raffaldini después de un día ajetreado en la casa. Cuando el clima es cálido, nos encanta venir aquí y disfrutar de la vista mientras tomamos su vinos deliciosos. La vista es estupenda, se puede ver desde el patio una maravillosa cordillera de las montañas de Carolina de Norte. Además de encatarme su vino de verano, también me fascinan las rosas amarillas que adornan la entrada de la carretera de tierra. Este lugar es una combinación de toques rústicos y sofisticados, el cual es un combo que más o menos grita mi nombre. En esta ocasión, decidí usar una blusa de hombro desnudo con un par de sandalias de gladiador. Quería mantener un buen equilibrio con mi traje, por lo tanto me puse una falda midi, de esa manera dejé que mis hombros controlaran la charla en lugar de las piernas. El uso de un collar sin duda, no era una buena idea, sin embargo, un par de pendientes de araña fue una idea genial para ponerse con una blusa de hombro desnudo. Sin sombrero? Bueno, aveces me gusta hacer sobresaltar otros atuendos y por lo general los sombreros roban bastante la atención. 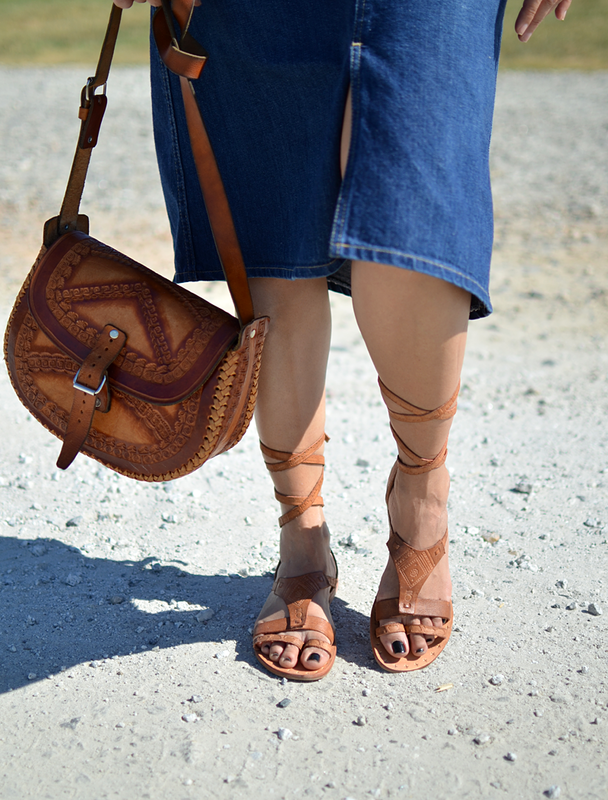 I love my new lace-up sandals by Free People! I can't believe how comfortable they are. The day of this photo shoot besides walking around the vineyard, in our way back, we stopped by downtown and walked around looking for a place to have dinner. Before we returned home from downtown, I visited my older son and I walked his dogs as well. After all that walk, I didn't end up with blisters or pain in my feet! These sandals are awesome and I just hope they last me for a while. My picks right now from this winery are The Montepulciano 2013 and La Dolce Vita (showing on picture) which is perfect for pairing with picnic small bites.